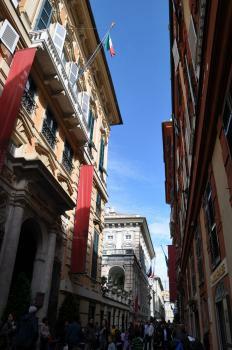 Genoa: Le Strade Nuove and the system of the Palazzi dei Rolli represent an innovative form of urban planning. They are also considered landmarks in Baroque and Mannerist architecture. Le Strade Nuove consists of the Via Garibaldi, Via Balbi and Via Cairoli. 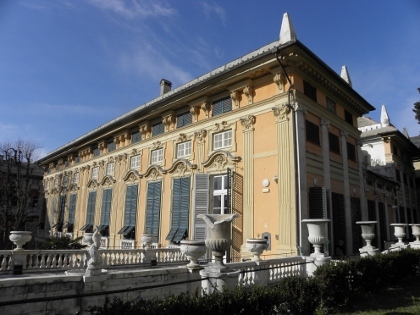 They are known for their aristocrat houses and the Palazzi dei Rolli (palaces). The palaces were built between the 16th and 18th centuries by local noble families. They were also used for official representative purposes by the Republic of Genoa (those that were on the list, the Rollo). Genoa was a welcome surprise after gloomy Turin. Although both its main train stations promised nothing good, I quickly fell for Genoa’s bustling mediterranean atmosphere. The medieval quarter is an interesting maze to walk in, especially in the dark of the evening. There are plenty of café’s and restaurants to sample the local specialities, such as the focaccia bread. I stayed for 2 nights at the Hotel Metropoli. My room came with a view on (part of) the WHS, the 3 former palazzi on Piazza Fontane Marose. One is now occupied by a bank – and that proved to be the case with several other of the 42 former Rolli-palaces. The buildings are too large for residences nowadays, having 3 or 4 floors and covering a decent portion of a street block. One only wonders if all these banks are still able to pay for it…. Early Tuesday morning I walked the streets that are covered by this WHS. I visited the interior of 4 palaces: Spinola, Rosso, Bianchi and Tursi. More I could not handle, and to be honest I already was bored at Palazzo Rosso. This is being refurbished at the moment, and all that remains is an art collection. Art (mostly paintings) also features heavily in the other palaces, they serve as museums. It might be offensive to say, but it is mostly second rate art (students of Caravaggio etc.). Or just not to my taste. Italy has presented this WHS cleverly, has found an interesting angle with the focus on the “Rolli-system”. The “palaces” (actually town villas) themselves aren’t spectacular in their own right. Although its dark and narrow alleyways can be rather oppressive at night, Genoa is a charming city by day with a rich seam of 'palazzi' running through its centre. I visited in July 2014 before heading to the Cinque Terre down the Ligurian coast. The best view we found of the city was from the top of the Palazzo Rosso, where you can go up to the roof terrace and get a panoramic view over the city. The palazzo's curators were extremely insistent that we follow the pre-specified routes around their almost empty museums, so we found ourselves being forced to go up to the roof terrace a second time after taking a shortcut on our way back down from our first visit to the roof! 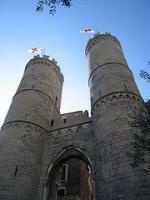 In the Middle Ages, Genoa was one of Europe's major cities and rivalled Venice in importance and wealth. Much of that glory has faded, and today, even though it is still one of the most important ports in Italy and the whole Mediterranean, Genoa is not on most people's itinerary of Italy - unless they take a ferry to Corsica or Sardinia. That is a pity, since the Old Town and the Port are full of interesting sights and offer a lively Mediterranean ambience. I really liked the Cathedral, the Doge's Palace, and especially the fantastic Aquarium. Genoa is also an easy pick for WH collectors, since the ensemble of palaces on the Strada Nuova is really very central (and clearly signposted), even though, admittedly, they are not terribly interesting. Most cannot be visited, and those that can (there is a combined ticket) mainly feature modestly interesting art collections. By far the most beautiful of them is the Royal Palace (Palazzo Reale), a bit further down the street, which really lives up to its name with its lavish interior and pretty courtyard. 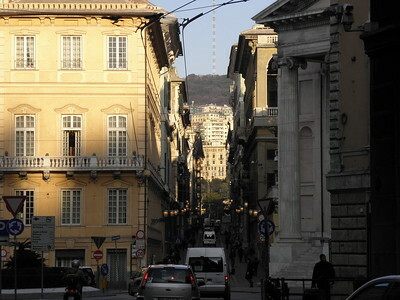 For me, Genoa was definitely worth a visit - just don't go there for the WHS alone. I visited this WHS in September 2006. 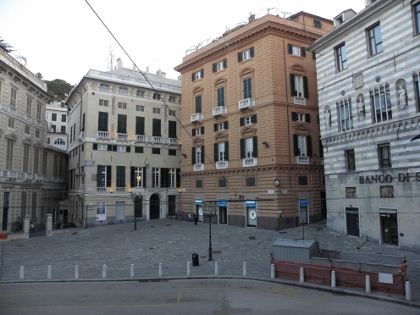 The Strade Nuove of Genoa are an example of early urban development projects. The Palazzi dei Rolli are truly unique. There are several historical and cultural sights to see in Genoa as well as modern structures such as the Matitone, the Bigo and the port. Only a few metres down via Balbi from the Piazza Principe station is the huge Palazzo Reale. Passing through the entrance I came to a spacious courtyard with an arched gateway leading to the garden overlooking the port of Genova. Suitably impressed I continued past several other palazzi lining via Balbi, Cairoli and Garibaldi before reaching the stately Piazza Fontaine Morose. Returning to the station I visited the interior of Palazzi Spinola, Rosso and Bianca and diverted to visit the narrow streets of La Madelena, via San Luca and via Lomellini. Located on the shore of Mediterranean sea, Genoa or Genova is famously known for its maritime heritages under its former glory, the Most Serene Republic of Genoa, and today the capital of Liguria and the biggest port of Italy as well as part of industrial hub together with Turin and Milan, and incredibly one of biggest well preserved medieval city in Europe. I entered Genoa with no expectation, after I took the new metro line from the train station to the city center of Piazza De Ferrari, the first image of Genoa was really surprised me with the wide square of grand buildings and many cute red and green fountains, a mini Trafalgar square I would described, also the nearby Palazzo Ducale and the cathedral were also the same league of magnificent. The palaces were beautiful, and built in the different styles, my favorite one was the Palazzo Lomellini Nicolosio with its lovely blue and white stucco and dreamy ceilings. The Palazzo Spinola was also great with great fresco while Palazzo Baldassare was simply elegant with its green tone. The biggest palace on Via Garibaldi is the Municipio or Palazzo Bianco which has nice gardens, and don't forget to admire the Palazzo Rosso which now turned to be an art museum. 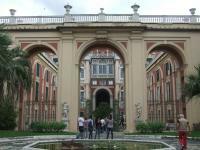 All in all, these palaces were just amazing and show us how wealthy of the owners and the economic power of the bygone Republic of Genoa. In my opinion, all the palaces were deserved to be protected as a UNESCO World Heritage Sites as the representative of Genoa in world history, but why not included the entire great medieval city of Genoa? Why Italian Government decided to nominate just a small part of this city and use the whole medieval zone as buffer area. I did not know or this was just another technique of nomination, to nominate just a small part of the city instead of large area which required more works and more money and maybe more fights with ICOMOS and UNESCO? Anyway Genoa turned to be my surprised, and Via Garibaldi was a fine place to visit, not a must but just an extra place to fill your trip while looking for a nice pasta with Pesto alla Genovese in this La Superba.